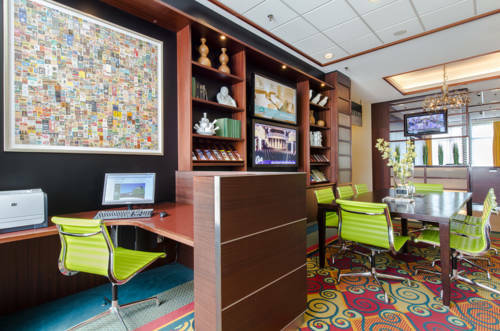 Courtyard Amsterdam Airport offers convenient amenities and comfortable accommodations for business and leisure travellers alike. Depart from Amsterdam Airport Schiphol in our airport shuttle to ignite a relaxing stay at our hotel. After checking-in, explore the best that the area has to offer such as Haarlem City Centre and Claus, a thriving dining and entertainment hub. Return to your guest room and lounge on our plush bedding while streaming your favourite Netflix shows on our flat-panel TVs featuring Google Chromecast or browsing the internet with our free Wi-Fi. In the morning, kick-start your day with a breakfast buffet at Brasserie Courtyard, our on-site restaurant, and return in the evening for a handcrafted cocktail or mouthwatering meal. If business brings you to Hoofddorp, our 10 event rooms are perfect for hosting small meetings or large conferences with your colleagues. Whether you're in town for a week or catching a flight, ensure a seamless stay at Courtyard Amsterdam Airport. Brasserie Courtyard: Enhance your travel with a hot breakfast buffet, quick lunch or delectable dinner at Brasserie Courtyard, our on-site bar and restaurant. Whether you're visiting Amsterdam or going to Airport Schiphol, join us for a quick bite, a casual meal or cocktail.